You are currently browsing articles tagged Celtic Christianity. 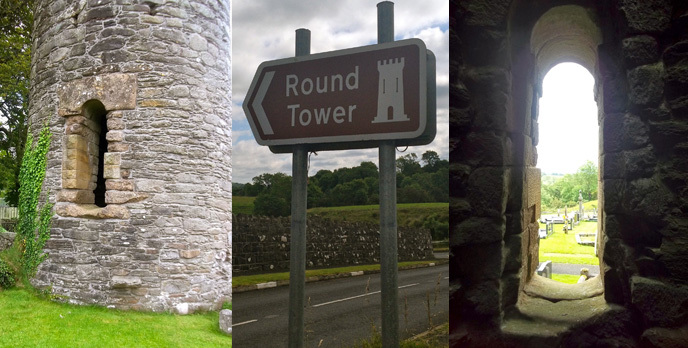 On an unassuming road between Ballymoney and Ballycastle in County Antrim, Northern Ireland, you’ll come upon the tiny community of Armoy, which contains a slightly unusual round tower. 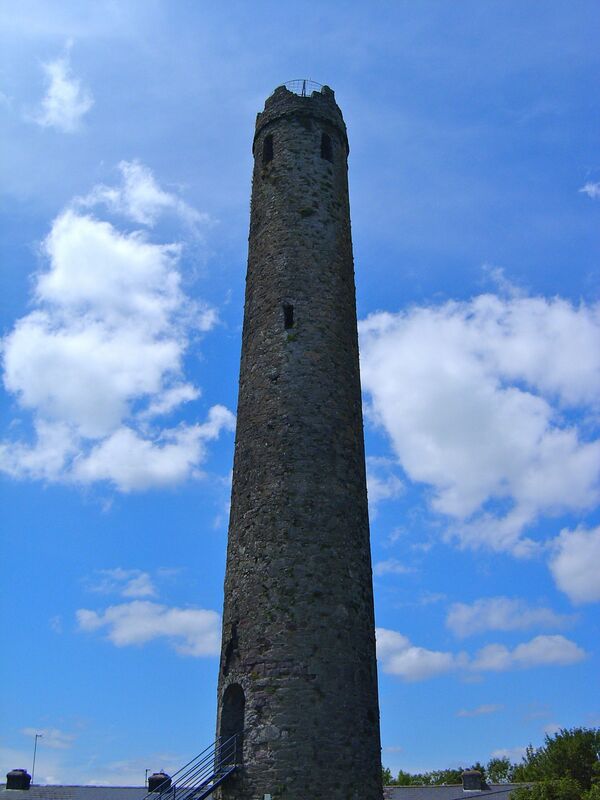 Climbing Kildare’s Round Tower: A Must for Your Irish Bucket List! While Ireland has a wealth of round towers surviving in various states of disrepair, only two can be climbed, and Kildare is the best of these. 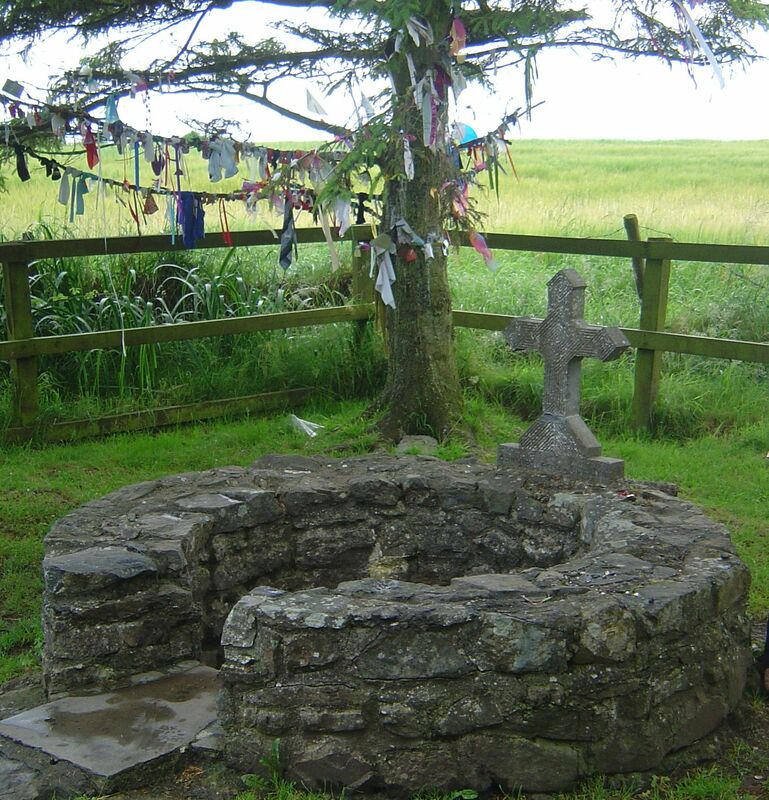 Just outside Kildare town you’ll find not one but two wells sacred to St. Bridget. 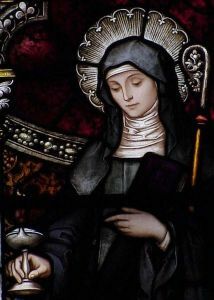 The stories of the goddess Brigid and the later St. Bridget are so intertwined as to be nearly inseparable. The ancient feis of Imbolc was co-opted as St. Bridget’s Day, one of the most-popular saints days in Ireland and the Irish diaspora. Imbolc (celebrated January 31-February 1) is an important feast day in the Celtic tradition. 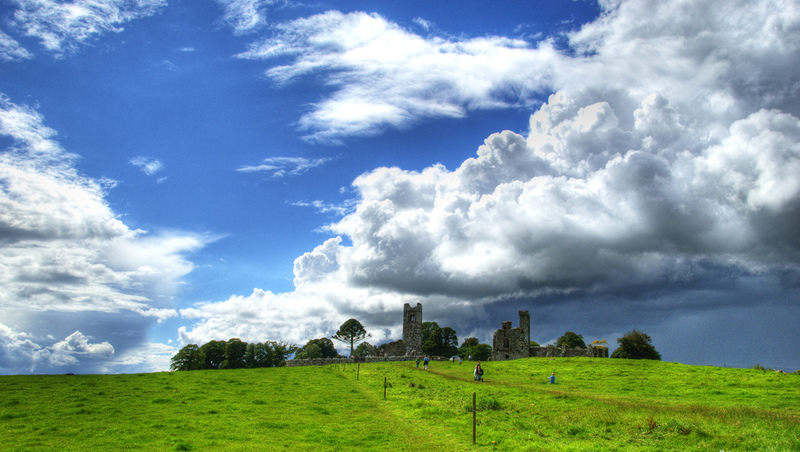 The Hill of Slane is one of the major archaeological sites associated with early Christianity in Ireland, but recent research has suggested that there may be more truth in the ancient legends about the site than previously thought. Have You Ever Seen a “Ghost” Round Tower? At Duleek, a small village near Drogheda, a large medieval bell tower stands by a ruined church on the outskirts of the town. The first thing you’ll likely notice about this site is there are two church towers side-by-side. The smaller one belongs to “The Spire” restaurant, which is housed in a deconsecrated church building much younger than the tower that looms over it. This tower marks the remains of Duleek Priory, a 12th century monastery built by the Augustinians. 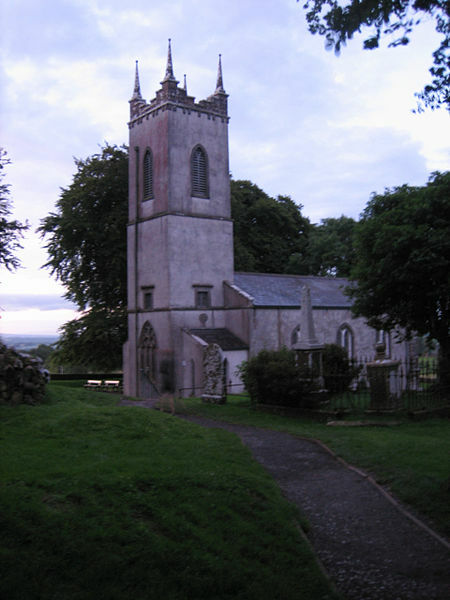 However the site itself is reputed to have been the location of the first stone church built in Ireland around about 472; founded by St. Cianan (c. 442-489), who was converted and consecrated a bishop by St. Patrick himself. Consequently, Duleek has in many ways as strong a claim to historical significance as the nearby monastic sites of Monasterboice and Slane. The main interest of the site today, however, lies in the ghostly afterimages it retains of its own storied past. The side view showing the ghostly utline of the round tower that once stood on the site. Note the doorway near what would have been the top of the tower, suggesting the round tower may have served as a staircase for a time. While the remains of the original stone church can be seen in very overgrown condition at the edge of the site (so overgrown that it’s really not possible to explore it anymore) the bulk of the ruins belong to the 12th century abbey built by the Augustinians. Most of one long side wall links the mostly-intact tower with the the skeleton of the great central window at the other end of the main building. A large sarcophagus-type tomb stands inside in what would have been the main alter area of the church. Near the top of the tower the original roof line can be seen, demonstrating by its height and the ornamentation of the windows how far the engineering ability of the Irish church had come since the early days of that first stone church. Near the spire restaurant you’ll find the remains of an old high cross, and throughout the church yard there are broken fragments of others; all suggesting the great center of learning and religious art this once was. Walk around the corner of the bell tower you’ll note part of the wall is very uneven and dilapidated. However, change your perspective by walking over to the graveyard wall and the scar in the side of the tower might make more sense. Gently tapering to a conical point, the north wall of the tower shows the impression of a round tower, a ghostly image of a tower, carved in its side. Studies have suggested this was the original round tower on the site, which may have been the only part of the abbey still relatively intact after centuries of Viking raids had left the monastery without an abbott and possible uninhabited by the time the Augustinians were granted the land by Hugh de Lacy after the Norman conquest. 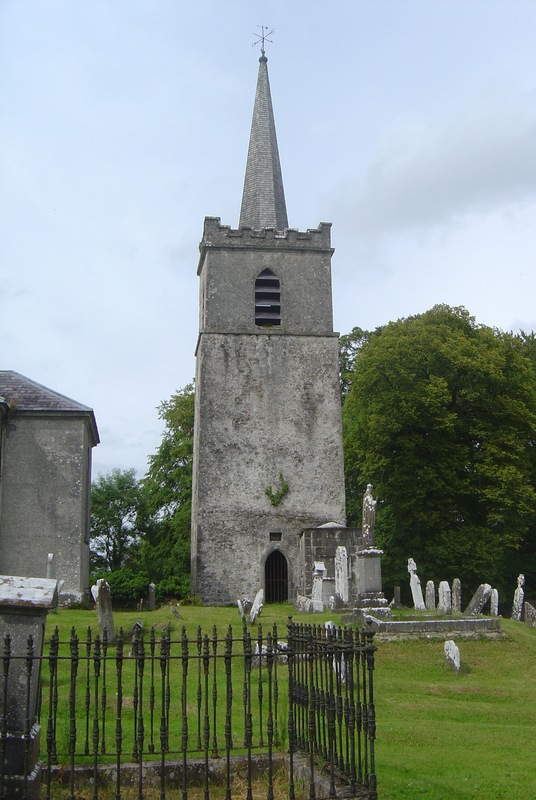 The churches annals record that the cloictheach (bell tower or round tower) of Duleek was hit by lightening in 1147 and the roof was demolished. Going by the impression left in the side of the 12th century bell tower, the roof may have been replaced sometime before the Abbey was constructed in 1182, and the builders simply incorporated the round tower into the wall of the much larger bell tower. In fairness, that repair could have been made as the new abbey was going up, but it’s hard to see why the builders would have incorporated a damaged and relatively short round tower into the new bell tower. The incorporation of a round tower into later construction of a bigger building is not completely unknown; the tower at Lusk in Co. Dublin was incorporated into the church there, and continues in use as a bell tower, but that building is no bigger than the original tower, so incorporating it would have saved time, expense and materials. 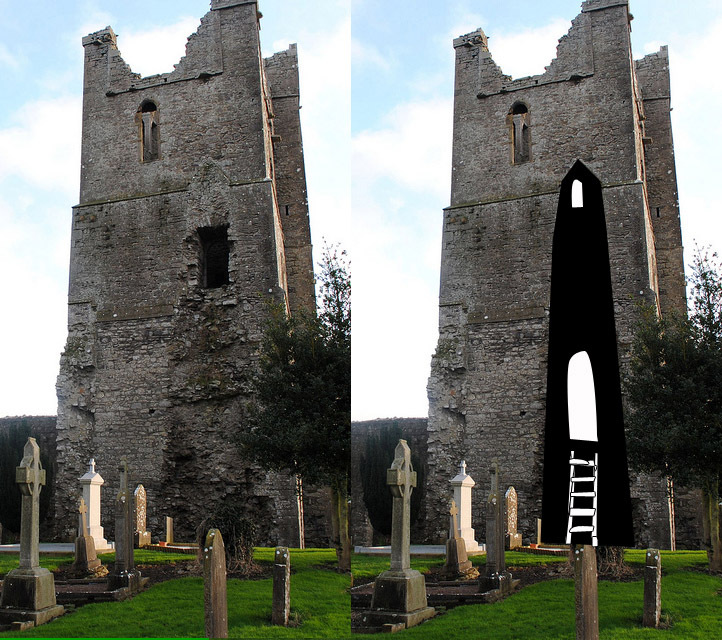 Why the tower at Duleek was so adapted is a bit of a head scratcher. It’s interesting to reflect that the height of the ghostly impression of the Duleek tower would have made this one of the shorter round towers in Ireland. Suggesting that the ground level surrounding the tower may have changed significantly since it was first constructed. Whether this was a change made during the building of the abbey (perhaps to afford direct access to the tower’s door?) or as a result of the cycle of destruction of earlier churches and monastic buildings is unknown, but the riddle of this ghost tower presents some intriguing possibilities. 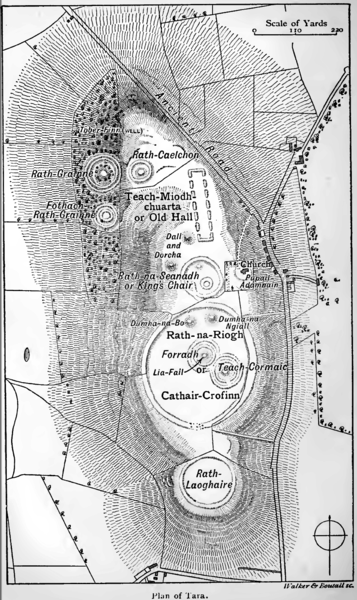 A Brief History of the Hill of Tara: Seat of Secular and Spiritual Power. 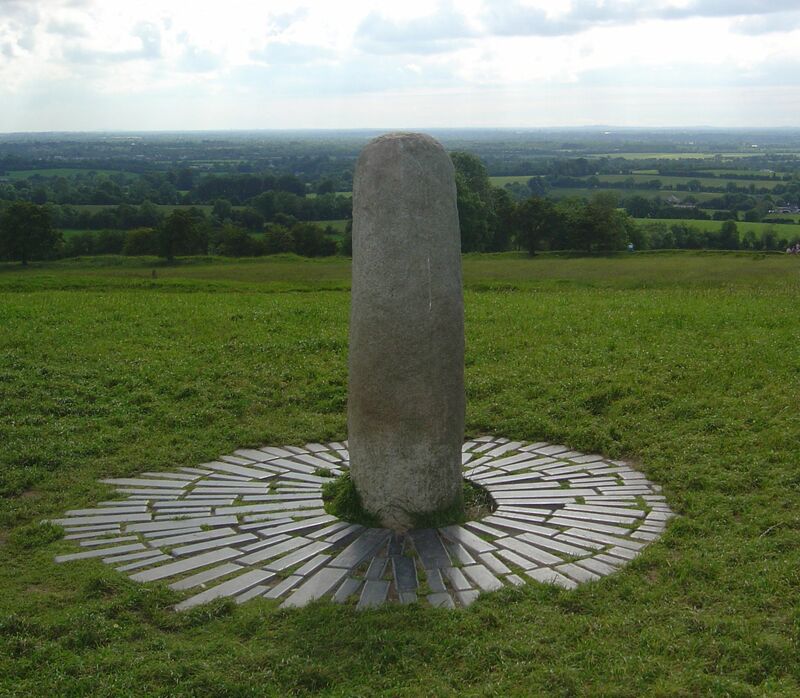 A few miles south of Navan, Co. Meath lies the Hill of Tara, the ancient capital of Ireland. Unlike our modern conception of a capital city, however, Tara appears to have been a symbolic or ritual capital, rather than a large center of commerce, administration, and public life. Evidence of extensive dwelling space or large-scale defensive earthworks have not been found, suggesting its use was primarily ritualistic: it was where one went to be crowned, set down laws, or settle disputes. The Lia Fail, the phallic stone that is said to scream for the rightful High King. The archaeological remains suggest that the settlement was never more than a small cluster of hill-top raths, various wooden buildings and animal enclosures alongside some sacred monuments. The population would have swelled for feasting or other ceremonial occasions, but otherwise the hill may have sustained a much smaller number of inhabitants, possibly druidic caretakers and masters of ceremony. Its Irish name is Teamhair na Rí, the Hill of the King, but it’s important to note that the high kingship was not hereditary — although many high kings would have liked to make it so — and different families from all over the country held the high kingship over time. This was probably only possible because Tara was a neutral or communal space. When you stand on the top of the hill on a clear day, you can easily see why the site was of such significance to the early Irish. From the hill top one can see the other major hills in the midlands and east of the country, many of which boasted settlements or culturally significant tombs: the Hills of Slane, Skrne, and Tailte, the Hills of the Witch/Slieve na Callaigh near Oldcastle, The Hill of Uisneach in Co. Westmeath, and Slieve Gullion and the Mourne Mountains in Co. Down. A bronze-age chieftain standing on top of his rath would have felt he could see the entire country from that point. It’s no wonder they came to think of themselves as the High King. The passage tombs of Newgrange and Loughcrew (if not others) were specially topped with white quartz to be seen glittering at a distance. On feast nights, the bonfires from these and other hilltops would probably have been easily visible, giving a feeling of solidarity and community to those watching from the best vantage point, the high ground: Temair, the Hill of the King. Tara was the seat of the High King at least from the Iron Age through to the Norman Invasion (1st through 12th centuries) and a place of importance long before that. Ancient legends name Tara/Temair as the seat of the the king from the arrival of the Tuatha de Danaan, and its symbolic importance endured long after the High Kings were but memory, with the patriot Daniel O’Connell choosing Tara as the site of an enormous political rally (drawing three-quarters of a million people, by contemporary accounts) in 1843. The recent outcry over the encroachment of a new motorway across the hill’s boundary showed that even in the modern world, Tara retains an emotional importance for the country. There are visible remains of almost 30 man-made monuments around the hill, and traces of as many more can be detected under the vegetation using modern non-invasive survey techniques. All of the buildings on the Hill of Tara — except of course the modern church — seem to have been wooden and have now rotted away. Archaeologists have found post holes and evidence to suggest huge structures, possibly for banqueting and hosting important meetings. The remaining evidence of inhabitation are large earthen ditches and banks, known as raths, which were built up around the dwellings. Ráith na Ríogh/The Rath (Fort) of the Kings is the largest and most-visible of these enclosures, an iron-age hill fort containing two smaller raths. This is thought to have been the most-important rath within the settlement, the house of the king, and this enclosure takes up the summit of the hill. This rath is relatively speaking a latecomer to the hill top, enclosing several much older and more more significant monuments, including the mound of the hostages and the lia fail. I find it curious that in the later days of high kingship, no king attempted to fortify Tara, even the Normans — who built motte and baileys on every high point they could — respected the sanctity of the hill. 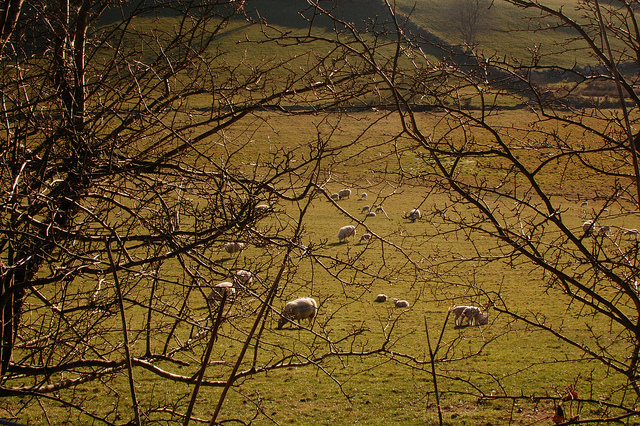 Outside the Rath of the Kings lies several other raths, or bank and ditch enclosures. Several are thought to have enclosed the dwelling places, and others to have been tombs. (Unlike Newgrange or Knowth, there has been comparatively little modern excavation at Tara.) Between the walls of the modern churchyard and the mound of the hostages there lies a seemingly chaotic series of mounds and ditches, known as the Rath of the Synods. These are the remains of another mound within a circular rath, which was crudely excavated by British Israelites at the turn of the last century hunting for the Ark of the Covenant. The same group of amateur archaeologists blew up the passage tomb at Dowth during their quest, and probably did more to destroy Ireland’s ancient heritage than any other group since the Vikings. The importance of Tara is illustrated by the siting of an early Christian church among the more-ancient monuments atop the hill. The early Christians were adept marketers, and knew that they needed to adopt many of the practices and customs of pre-Christian spiritual practices in order to win converts. The usual tactic was to build a church or hold services on sites important to the ancient Celts. The current church is naturally named St. Patrick’s Church, but it has been deconsecrated and currently serves as a visitor center, although a couple of services are still held there annually in continuation of a ritual tradition that spans at least 5000 years. Tara is the site where St. Patrick is said to have converted the High King Laoire, paving the way for the conversion of the country. In brief, Patrick is said to have lit a pascal fire on the hill of Slane (or possible at Brú na Bóinne), thus incurring the wrath of the High King, who reserved the honor of lighting the first Beltaine fire (the Celtic feast co-opted as Easter). Laoire’s druids are said to have warned him that that fire must be extinguished or it would burn forever, but rather than punish Patrick, the King is said to have been converted by him instead. This tale is generally considered to have been cooked up by Patrick’s hagiographers, rather than being literal fact, but that hasn’t stopped it becoming an important part of the Tara myth. What are Wishing Trees/May Bushes? Wishing Trees (aka May Bushes, Fairy Trees, or Rag Trees) are hawthorn trees where people tie ribbons to ask blessings from the local saints/deities/wee folk. The hawthorn flowers in May, time of the Bealtaine festival of rebirth (now generally known as May Day). 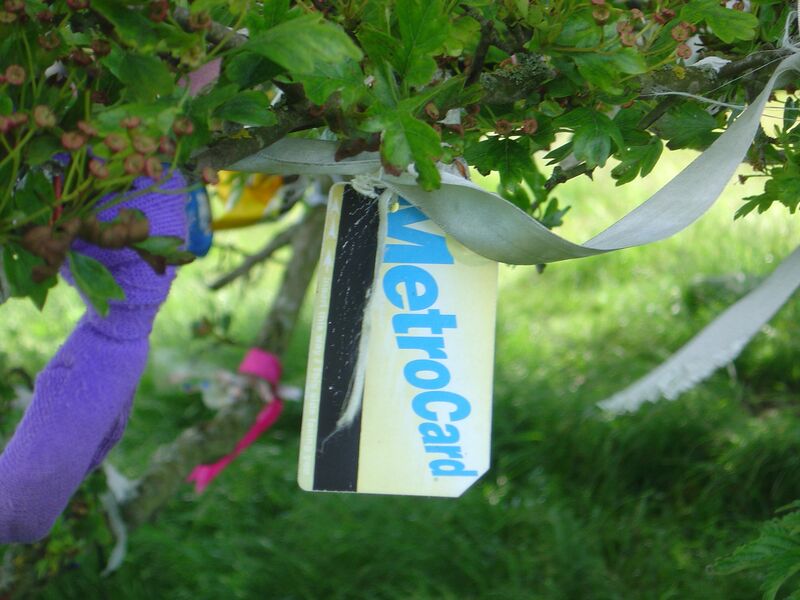 Local people still tie ribbons or strips of colorful cloth to the wishing tree as a symbol of their prayers or wishes. If you visit in May or June, you’ll find wishing trees covered in colorful fabric and rippling in the breeze. If you visit after the summer — you might not even notice the tree, as the decorations will be sun bleached, rain soaked, or blown away (unless the site is a popular tourist attraction). May bushes were usually associated with a holy well, but time has often dried up or filled in many of the wells. The wishing trees that still grow beside known holy wells tend to be used year-round. Conventional and Unconventional clotties side-by-side at the Hill of Tara. The ribbons and colorful items tied to the tree are known as clotties. When we visited Tara last summer it was just seven weeks past Beltaine, and the the tree was still a colorful presence. Among the usual ribbons, we spotted some rather unusual trinkets and gifts, including a large number of pacifiers, perhaps in thanks from grateful parents? The offerings at a popular location like Tara tend to be rather idiosyncratic, presumably because many of the gifts are impromptu. Our eldest daughter likes to make origami cranes, and leave these as her gift to the spirits. Another popular site with a wishing tree is St. Bridgid’s Well in Kildare. The signposted well is actually a 1950’s replacement for the original well, built a couple of hundred yards away. The original well is now in a corner of the Japanese Gardens’ car park (it’s also known as the Wayside Well). The newer well is nearby, and is set in a little park with various stations for the faithful to contemplate the various aspects of the saint. The tradition of leaving clotties to ask blessings of the saint continues at both wells, although the tree serving this function at the modern well is not a hawthorn. St. Brigid’s Well, Kildare, with clotties on the tree behind. 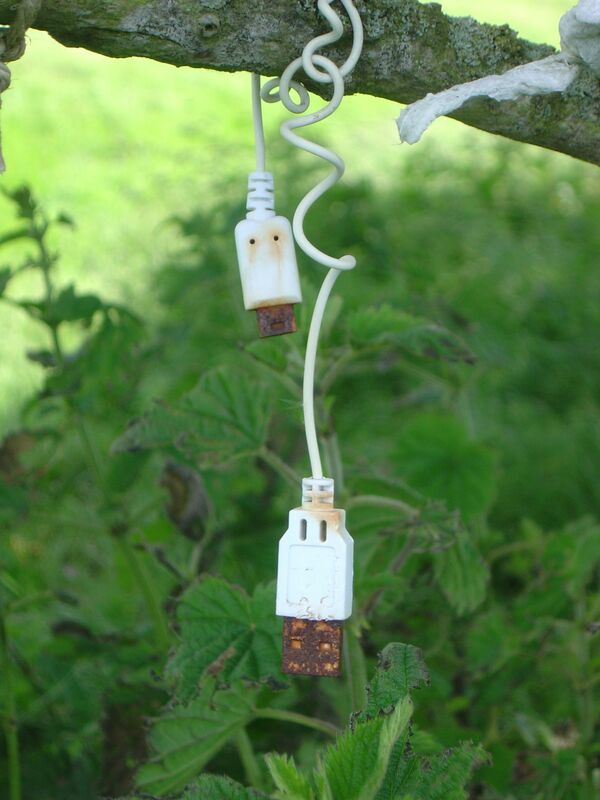 So, be on the lookout for wishing trees while you travel around Ireland. They’re easy to spot in May and June, but you might have to look a little closer during the other months. Sign of the times? A modern offering left on the wishing tree on the Hill of Tara. What items are appropriate to hang on rag trees? Today is Cemetery Sunday in the parish where I grew up, so it’s a good opportunity to post a short piece about this old Irish tradition. Cemetery Sunday usually consists of a service in a graveyard to remember the dead, and it is one of the shared dates that many communities revolve around. Relatives work to spruce up the cemetery for weeks before, and many graves will be decorated with fresh flowers and wreaths, headstones freshly scrubbed, and plots weeded. Not all graveyards get a service, however — there are so many — but families with relatives in these cemeteries will spruce up the place nonetheless. In the larger towns, traffic can sometimes be brought to a halt, the streets lined with cars. But, the day is perhaps most important to the communities around many of the deconsecrated churches throughout the country, because although the churches may not be in use, their graveyards will always be — indeed they may still called into service several times a year. For these locations, Cemetery Sunday may be the one religious service of the year, and for the communities around these graveyards it is a significant event, reaffirming bonds of community and kinship through the pervious generations. 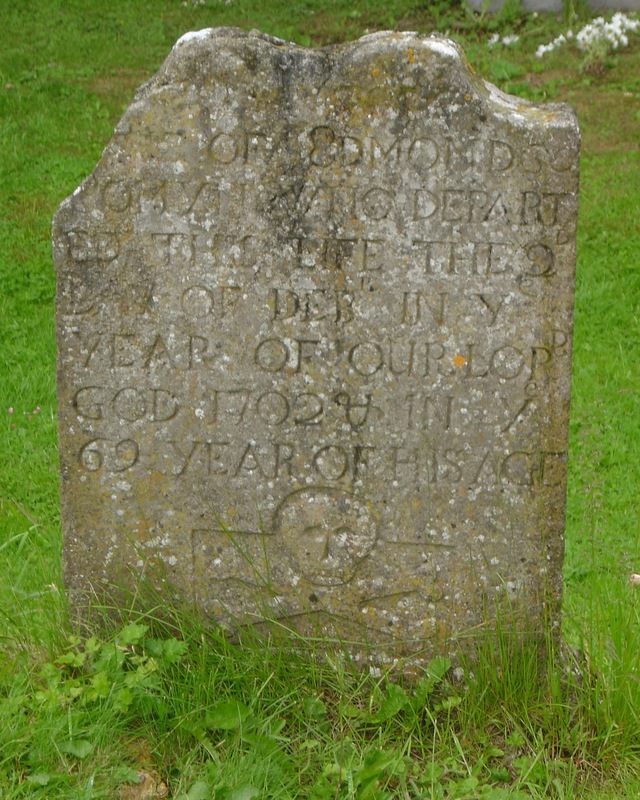 1702, and not even the oldest gravestone in this cemetery. It’s possible that the Cemetery Sunday tradition grew out of the medieval “pattern days.” These were days set aside to honor local saints (who often founded the local church) and perform a series of prayers, stations, etc. (patterns) at (or more often around) a churchyard or holy well. Although, in order to increase the likelihood that the weather will be more cooperative, most parishes now hold their cemetery sunday celebrations during the summer months. It can be odd to find dozens of cars parked along the sides of quiet country roads where the only traffic is normally the slow morning and evening trudge of cows on the way to be milked. Visitors coming upon a remote country churchyard teeming with people and looking well-cared for can be tempted to interpret this as a sign of strong faith and a strong religious community — all the old stereotypes about the land of saints and scholars seem to be at once confirmed. This is not necessarily the case; neighbors may choose to attend services at different local churches, or not at all. Many may only attend on one of the major feasts. But, Cemetery Sunday is about honoring the ancestors, remembering parents, grandparents, great grandparents, and reminding ourselves of the larger connections within the community. 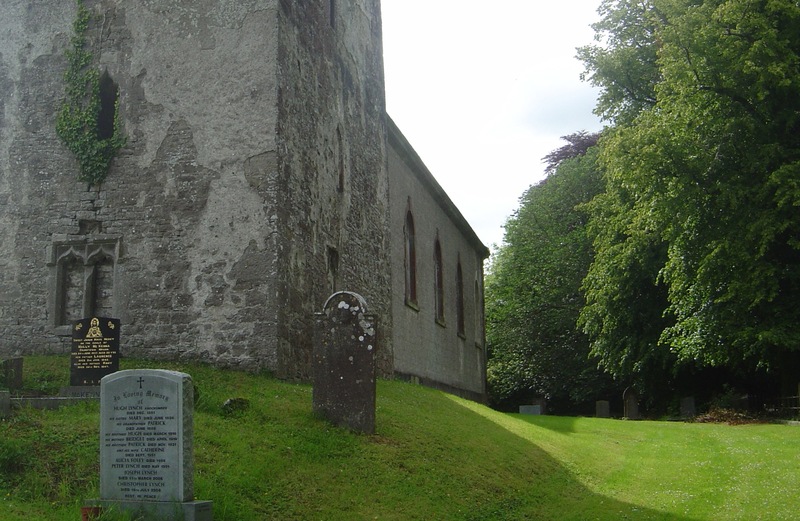 People trying to trace their Irish roots via web forums and late-night emails to parochial offices might do well to attend the Cemetery Sunday service in their original family townland, and strike up some conversations with the other people present. Everyone congregates around their family plots, so it would be easy to find others with the same name, and identify common ancestors — after all, gravestones are essentially a three-dimensional family tree. Before you go, consult the parish bulletin (now often posted online) to discover the dates of Cemetery Sunday for your parish of origin. Update: As far as I know, these services are performed by Catholic priests. However, some of the old churchyards are often those of deconsecrated protestant churches. Many of the deceased in these cemeteries will be of both faiths, as families will have inter-married over the years but sought to keep the deceased together in one cemetery.